I went out for my last run of the year this morning. Despite a number of years running experience I made the fatal mistake of not “emptying the tank” prior to the run and 5 miles into a 10 mile run it started to feel uncomfortable downstairs. By mile 9 it was near total desperation as I gritted my teeth to make the final mile back to my house for a much needed use of the toilet. A few minutes later I spotted my house, my moments of desperation were nearly over. I grabbed the house key from my pocket as I ran the last few yards to save a few seconds of time opening the front door so I could make a quick dash to the bathroom. As I arrived at the door I glanced at my Garmin…. 9.92 miles done. Dammit! Despite the grimace on my face (and clenched buttocks) I set off for an additional 0.08 of a mile to make it a round 10-mile run. You see, I like my stats and thanks to the Fetcheveryone website for providing the free tools to track and recount all of my running stats, a summary for the is listed below. I have already blogged about my running year here if you are interested in the more descriptive summary of my year. If “Sue” removes her “rogue” 4,000 mile run one day in December. 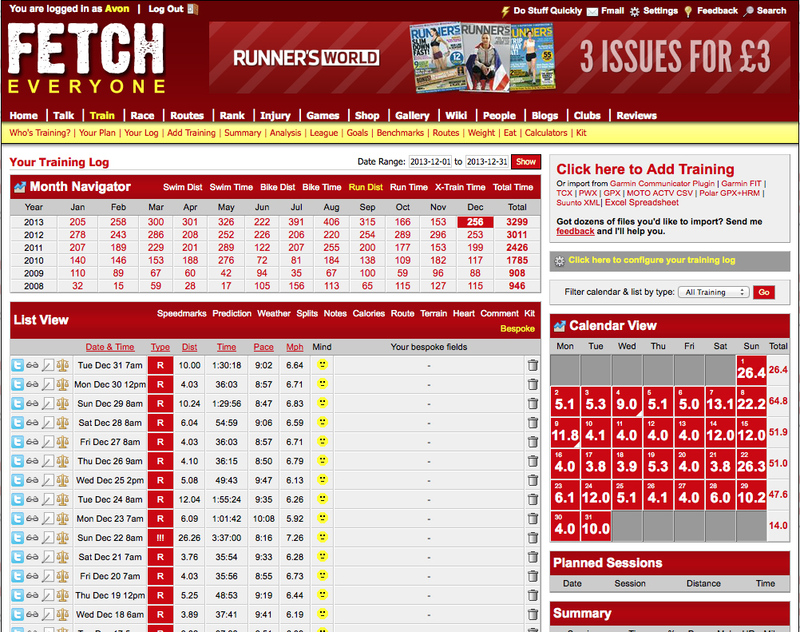 I may even stay on Page 1 of the Fetch Mileage league aswell. Great stats! Get back out and do that extra mile today, that would drive me nuts! As I said before, that looks like a remarkable year. I was surprised to see long runs make up only 2% of your total….is that because a) your long runs are recorded as races and b) you otherwise just log them as ‘general runs’? Best wishes for 2014. If mine is 25% as successful as your 2013 I’ll be happy! Looking at this, the % should be a bit higher so I probably haven’t categorised each run accurately. However, I do run lots of short runs during the week and just do the occasional long run (over 16 miles) perhaps once or twice a month using other events as long training runs.